Stockholm (AFP) – Researchers expressed concern Thursday about the rapid pace of climate change, after a glacier on Sweden’s Kebnekaise mountain melted so much in sweltering Arctic temperatures that it is no longer the country’s highest point. “It’s quite scary,” Gunhild Ninis Rosqvist, a Stockholm University geography professor who has been measuring the glacier for many years as part of climate change research, told AFP. Stockholm University/AFP / Carl LUNDBERG. 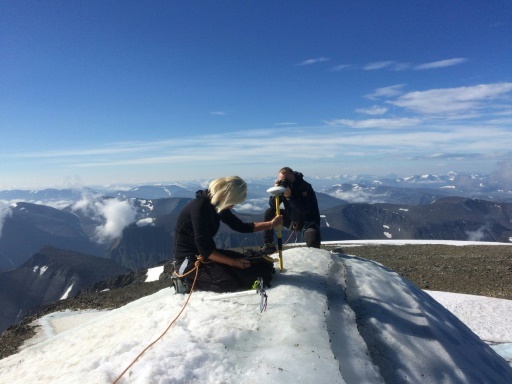 A handout picture released by Stockholm University taken on July 31, shows Gunhild Ninis Rosqvist, a Stockholm University geography professor making measurements of the glacier atop Sweden’s highest point on the southern peak of the Kebnekaise mountain in Sweden’s far north. “This glacier is a symbol for all the glaciers in the world. This whole environment is melting, the snow is melting, and it affects the entire ecosystem: the plants, the animals, the climate, everything,” said Rosqvist, who is also the head of the Tarfala research station near Kebnekaise. A popular tourist destination located in Sweden’s far north, Kebnekaise has two main peaks — a southern one covered by a glacier and a neighbouring, northern one free of ice. “It looked different this year. The snow was melting, the glacier surface has never been as low as it is now. I saw meltwater trickling down the sides, I’ve never seen that before,” Rosqvist said . . . According to Martin Hedberg, meteorologist at the Swedish Weather and Climate Centre, “extreme heat is 100 times more common today than it was during the 1950s, 60s and 70s” globally. “The temperature differences between the Arctic and the Mediterranean are narrowing,” he told AFP . . .
“It’s an election this year in Sweden, and yet no one is talking about this,” she bristled, referring to the country’s general election on September 9. With the last three years being the hottest ever recorded on Earth, she said changes were needed “in the way our societies are structured” to reduce greenhouse gas emissions. “Many people want these changes, and they’re prepared to change their consumer habits,” she added. 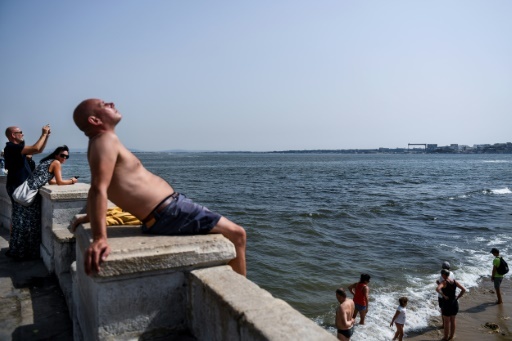 Madrid (AFP) – Europe sweltered Saturday in intense heat with temperatures hitting near-record highs of 46 degrees Celsius (115 degrees Fahrenheit) in Portugal, while elsewhere the high temperatures, exacerbated fires and melted the asphalt on highways. In southern Spain, the heat continued to pound the tourist city of Cordoba reaching 111 F./ 44 C.
In Catalonia in the northeast, a fire on the border with France forced the closure of a highway between both countries for several hours. By early evening, it was open to traffic again as firefighters said the blaze had been brought under control. That wasn’t the case for a wildfire in San Vicente de Alcantara in the southwest on the border with Portugal, where strong winds and high temperatures were fanning the flames, the regional environment and rural affairs department said. At least 11 water-dropping planes and other aircraft were helping firefighters on the ground. The soaring mercury has already claimed the lives of three people who died of heatstroke. The heatwave was expected to reach its peak on Saturday, said Paula Leitao of the Portuguese Institute for Sea and Atmosphere (IPMA). Featured Photo: AFP / PATRICIA DE MELO MOREIRA. In Portugal, temperatures are close to all-time highs. Over 700 firefighters helped by 10 water-dropping planes and helicopters were working to put it out, according to Vaz Pinto and the civil protection agency. In Lisbon, authorities have closed playgrounds and called on people to avoid picnics and other outdoor activities. Refuges for homeless people have also opened earlier during the day to allow them to take shelter from the crushing heat. In Vienna, police dogs due to patrol a beach volleyball tournament were fitted with special shoes. Police said that even if temperatures were not excruciatingly hot, reaching just 90 F/ 34 C on Saturday, the dogs would have to spend hours walking on surfaces exposed to the sun that could easily go over 122 F./ 50 C, and would still need the shoes. The central city of Zwolle, meanwhile, started cutting the branches of some 100 poplar trees. Dutch public television NOS explained that branches could break due to the heat and create danger for drivers or passers-by. AFP / PHILIPPE DESMAZES. Tailbacks in scorching weather on the busiest day on French roads. French power company EDF said the measures were taken to avoid temperature hikes in rivers. The nuclear plants draw water from rivers to cool down the reactors and then return it to the river. Saturday was also the summer’s busiest day on the roads, as July holiday-makers returned home and those who vacation in August departed. 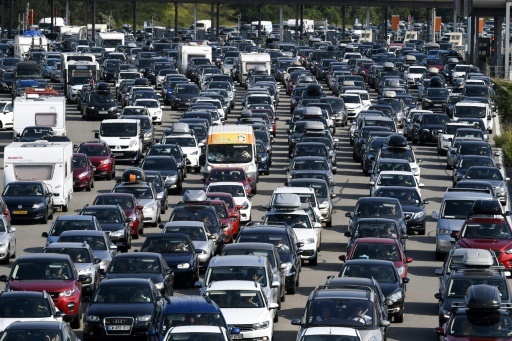 By late morning, some 705 kilometres (440 miles) of traffic jams had been reported, according to France’s traffic authorities, as the sun beat down and temperatures soared to 41.3 Celsius at Beziers in the deep south. A record 67 departments were on orange heatwave alert for Sunday — a number also reached on June 21 — with only the northwest set to be spared another baking day. 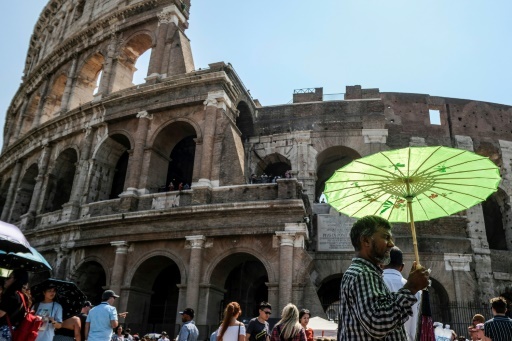 Italy too faced the summer’s busiest day on the roads for the same reason as France and media reported one woman aged 79 had died from apparent heatstroke on a beach in the northwestern Liguria region. This week, the Legambiente association for the defence of the environment published a report on the negative effects of heatwaves. It revealed that in Lazio, the region where Rome is located, heatwaves had caused around 7,700 deaths since 2000 . . . Featured Photo: AFP / Andreas SOLARO. Holiday-makers were expected to face adverse weather conditions wherever they went with no let-up in the scorching heat in the north and violent hailstorms forecast in parts of the south.